Right before her ninth birthday, Rose has a bite of a lemon cake her mom baked. It was a practice cake to make sure the recipe was right for the big occasion, Rose’s birthday. In that bite, Rose is overcome with her mom’s feelings of loneliness and emptiness. 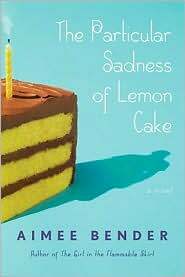 Rose’s magical power — tasting the emotions and background of the people who prepare the food she eats — takes center stage for about half of Aimee Bender’s second novel The Particular Sadness of Lemon Cake. It’s a fabulous, interesting premise that seems to get lost halfway through the book. Rose is kind of a lonely, odd-duck herself in a family filled with lonely, odd-ducks. On the surface the Edelstein’s look like American apple pie goodness and all that. Dad’s a lawyer, Mom’s an artist who works at a carpentry co-op, and brother Joe’s a budding scientific genius. But then there’s the cake filled with sadness and regret. It’s our first hint that things aren’t as they seem. This novel is at its best when it’s focussed on Rose, her gift, and the relationship she has with those around her. Bender’s a phenomenal writer. I can’t imagine any other writer who can write a scene involving a turkey sandwich that can bring tears to your eyes. Each chapter ending is a little kick to the chest as if to remind you how engaged you are in this story. So why did this book leave me feeling so empty, kind of like how I imagined the lemon cake tasting? Because Bender seems to lose her way. Instead of sticking with Rose, her strange abilities, and how that effects her relationships with the people around her, she veers off into a story about Joseph. He’s Rose’s older brother who may or may not be autistic. He’s obsessed with science, physics specifically, and how a penchant for disappearing — like into thin air, it seems. Joe’s also obsessed with being alone, and when he gets his very own apartment (paid for by his doting mother) things get really bad. Joe goes missing for days at a time, throwing his family into distress. After awhile we jump back from Joe’s story to Rose’s story which has leaped forward many years. The sibling’s stories don’t seem to blend well, because while Rose tells us about Joe and what’s going on with him, we hear less and less about the food and what she’s tasting. Bender never seems to get her footing back. The book feels sort of loosey-goosey with a few flashbacks thrown in to explain what really happened to Joe. It doesn’t sit well. As a reader I had a hard time reconciling Joe’s story with Rose’s and how together they told a bigger story, and what role Rose’s ability to taste emotions had to do with everything. This is one of those books I enjoyed reading, the journey is fun and engaging because Bender’s such a great writer, but once it was done I kind of wondered what the point was. Oh no! I was looking forward to this one. Sorry to hear it disappointed you. Ouch. I’m sorry to hear that you didn’t enjoy it. I still plan to read it but I’ll keep your reservations in mind. I enjoyed the process of reading the book, it’s well-written. I just didn’t like that I felt like it dropped me off in the middle of nowhere without a map.